Plans to open new grammar schools in England appear to have been accidentally caught by a photographer. 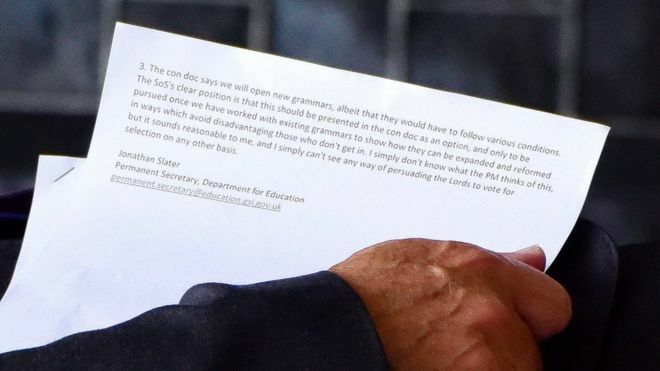 The document, photographed in Downing Street, proposes expanding current grammars before opening new schools. It then raises doubts whether plans for more selective school places would pass through the House of Lords. A government spokeswoman said it would be “inappropriate to comment on internal government documents”. “The cat is out of the bag,” said Labour’s shadow education secretary Angela Rayner. The document, being carried into 10, Downing Street, seems to have been written by Jonathan Slater, permanent secretary at the Department for Education. It refers to Conservative plans to “open new grammars”, although with the provision that they would have to “follow various conditions”. What does this document tell us? And does it suggest that as well as more grammars, there could be a new style of grammar, admitting pupils on more than test results. Education Secretary Justine Greening seems to want a slower approach, expanding current grammar schools before any plans to open new schools. There is also a hint of distancing, wanting new grammars to be seen as an “option”. Lifting the current ban on new grammars is not the same thing as opening lots of new schools. This isn’t about returning to a selective education system, but an option to have a modest expansion in some selective schools. Grammar schools would have some strings attached, presumably such as making greater efforts to include poorer pupils. This could mean changes for current grammar schools, with the rather coded reference to “not disadvantaging those who don’t get in”. The House of Lords is seen as a serious block to a return to selective education. Does that suggest no new legislation is imminent to permit new grammars? There have been concerns that grammars have a disproportionately affluent intake – and these “conditions” might suggest that new grammars might have obligations to admit more poorer pupils. There are also hints at a difference in emphasis within Conservative ranks – with the education secretary wanting to expand the current grammars before opening any new schools. A long-running dispute in Kent was resolved this year when an existing grammar school was allowed to open another branch in another town, on the basis that this was the expansion of an existing school, rather than opening an entirely new school. Education Secretary Justine Greening is described as wanting new grammars to be presented in the consultation document “as an option” and “only to be pursued once we have worked with existing grammars to show how they can be expanded and reformed”. Before opening any more grammars, the government would have to change the law, which at present outlaws the creation of new grammar schools in England. If the government thought that this would face too difficult a path through Parliament, existing grammar schools could open such “satellite” campuses on other sites. There have been suggestions that new grammars could be opened as part of the free school programme, which could be adapted to allow selection by ability. The prospect of a return to grammar schools has had some strong support among Conservative backbenchers. They have argued that admission by ability is more likely to promote social mobility, providing an opportunity for bright, poor pupils who do not live in the catchment areas of good schools. Sir Michael said a return to selection at 11 years old would be a “profoundly retrograde step”. ‘Back to the 1950s’ versus ‘Why ban something that works’? John Pugh, of the Liberal Democrats, said: “This lays bare the desperate lengths the Conservative party are willing to go to deliver grammar schools through the cloak of expansion. But Graham Brady, a leading Conservative backbencher and prominent supporter of grammar schools said: “Grammar schools are popular wherever they remain and opinion polls suggest that 75% of people in Britain want more of them. “It must be good news that the government is looking at repealing a statutory ban new grammar schools. Mr Brady said grammar schools should be available as “part of the mix where parents and communities want them”. Kevin Courtney, general secretary of the National Union of Teachers, said: “Theresa May said on the steps of Downing Street that she wanted ‘a country that works for everyone’. “Yet now we hear of proposals to take education back to the 1950s, when children were segregated at age 11 and their life chances determined by the type of school they attended. A government spokeswoman said: “The prime minister has been clear that we need to build a country that works for everyone, not just the privileged few. “We are looking at a range of options to allow more children to access a school that lets them rise as far as their talents will take them.